Oscar Wilde famously said, “Only superficial people think looks don’t matter.” Had he known them, Wilde would not have accused the shareholders of the La Touraine co-op at 50 Morningside Drive of being superficial. They take great care to preserve the original look of their 1905 building. “The owners are treating it like it’s a landmark, even though it’s not,” says the co-op’s engineer, James Blum, a partner at Joseph K. Blum Co. The six-story building, designed by the firm of Schwartz & Gross, features decorative brickwork and decorative stonework arches over recessed fire escapes. Along the roofline there is a decorative sheet-metal cornice. Several of the 24 units have French windows with Juliet balconies. 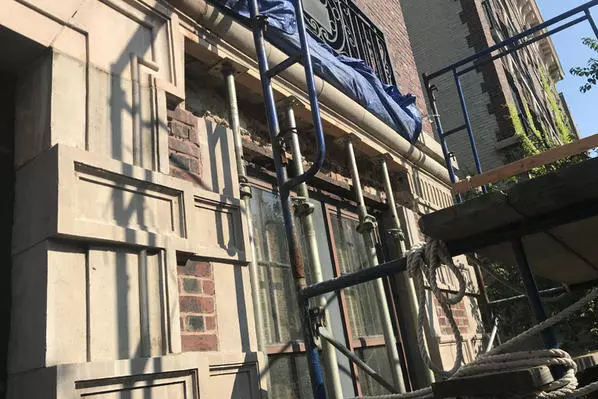 The board was performing mandated Local Law 11 facade inspections when cracks were found in the ornamental stonework over two windows on the second floor. The answer was simple. Brent took a hard look at the financial aspect of the situation and decided, with the support of the shareholders, that looks matter not only from an aesthetic standpoint, they’re also financially advantageous. PRINCIPAL PLAYERS – ENGINEER: James Blum of Joseph K. Blum Co. CONTRACTOR: Bellet Construction. STONEWORK: Essex Works Ltd. MANAGEMENT: Shamil Porto of H.S.C. Management.